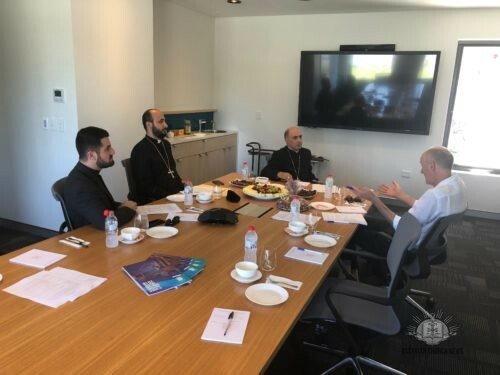 On Thursday 17 January 2019 His Eminence Mar Meelis Zaia AM, Archbishop of Australia, New Zealand and Lebanon held the third meeting to discuss the establishment and academic teaching commencement of the Nisibis Assyrian Theological College in Sydney. During this meeting Professor Dr. Matthew Del Nevo was appointed as Dean of the theological college. 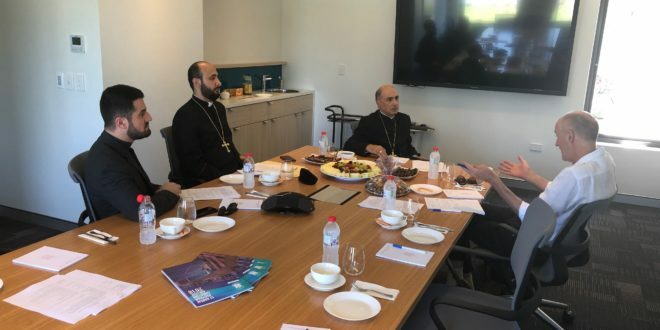 The meeting was held at the St Narsai Assyrian Christian College’s Horsley Park campus and included His Grace Mar Benyamin Elya bishop of Melbourne and New Zealand, Reverend Chorbishop Narsai Youkhanis and Reverend Father Shamuel Shamuel. The meeting covered agenda items that addressed administrative aspects of the College, teaching professors both from within the Assyrian Church globally and from sister institutions, and respective units offered. 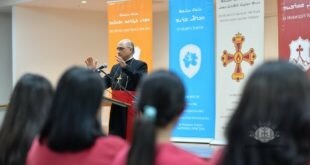 His Eminence Mar Meelis stressed the importance of this College to the newly appointed Dean, as a college with the vision to teach the holy doctrines of the Assyrian Church of the East to its students who will come from all paths of life; young men who wish to take on high rankings in the Church such as deacon hood, priesthood, etc., teachers who wish to teach Christian Studies at both St Hurmizd Assyrian Primary School and St Narsai Assyrian Christian College and similarly with all other schools to be open by the Archdiocese in the near future, youth workers who wish to lead bible studies for the association. This meeting was a follow-up to the two previously held in both Sydney Divinity College and at St Narsai College in June of 2018. These meetings were accompanied by Their Graces Dr. Mar Awa Royel Bishop of California and secretary to the Holy Synod, Mar Paulus Benjamin bishop of Eastern USA, Mar Abris Youkhanan Auxiliary Bishop of Erbil, Mar Benyamin Elya Bishop of Victoria and New Zealand, Reverend Archdeacon Dr. William Toma and Reverend Chorbishop Narsai Youkhanis whom met with Dr. Diane Speed, Dean of Sydney Divinity College in Sydney. This meeting covered official and administrative topics such as registration, finances, etc. Sydney College of Divinity, headed by Dean Diane Speed, governs the following institutions: Australian College of Christian Studies (ACCS), (formerly Emmaus Bible College) Australian College of Ministries (ACOM), Catholic Institute of Sydney (CIS), Eva Burrows College (formerly Booth College), Nazarene Theological College (NTC), NSW College of Clinical Pastoral Education (NSWCCPE), St Andrew’s Greek Orthodox Theological College (SAGOTC), St Cyril’s Coptic Orthodox Theological College (SCTC), and now Nisibis Assyrian Theological College. Avenues that have been explored across the three meetings also include online/distance education for those living abroad having certificates recognised internationally and dormitories for international students who will wish to live on campus.